Alternative splicing occurs when several splice donors and/or acceptors are eligible and facultative. This leads to transcripts having different splicing outcome and/or are unspliced. 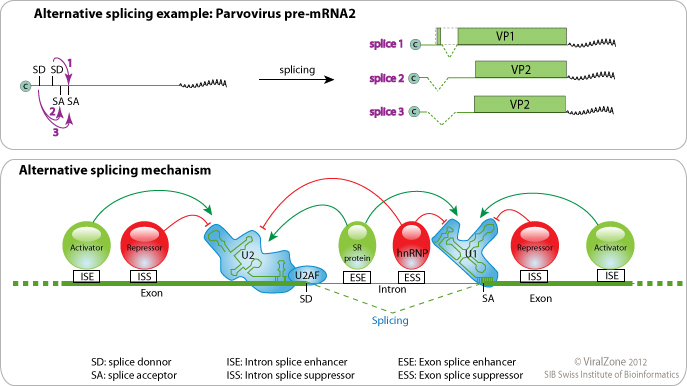 Alternative splicing is regulated by cellular and viral proteins which modulates locally the activity of splicing factors U1 and U2. -It offers the opportunity to encode several proteins in few messengers, like for Adenoviridae and Retroviridae encoding up to 12 different peptides from one pre-mRNA. -It is a way to regulate early and late expression for viruses like Papillomaviridae and maybe Orthomyxoviridae. -Cellular unspliced mRNA cannot be exported out of the nucleus. Hepadnaviridae and Retroviridae have evolved proteins to export their unspliced genomic RNA. -It is used by Herpesviridae as a potential anti-host defense mechanism. By inhibiting some host splicing factors, these viruses prevent the synthesis of key antiviral proteins like PML or STAT1.